The most badass collection of paper dolls--ever! Forget the runway. These Awesome Women Who Changed History are dressed for the battlefields, the picket lines--and the White House! These 20 realistic paper dolls have everything they need to shatter the glass ceiling. Prepare Sally Ride for liftoff with her spacesuit and helmet. Get Annie's gun (and her hat and dress) before she heads into a sharpshooting competition. And please rise for the honorable Ruth Bader Ginsburg, whose robes and gavel will have her ready to preside over the United States Supreme Court. "If you're wondering how to teach your daughters (and sons!) about the awesome women who have made a positive mark in our world, there's a new collection of paper dolls that celebrate badass women in history … .These artsy paper dolls are totally not limited to children only, so if you want to celebrate Women's History Month by picking up your own copy … there's no reason you shouldn't." 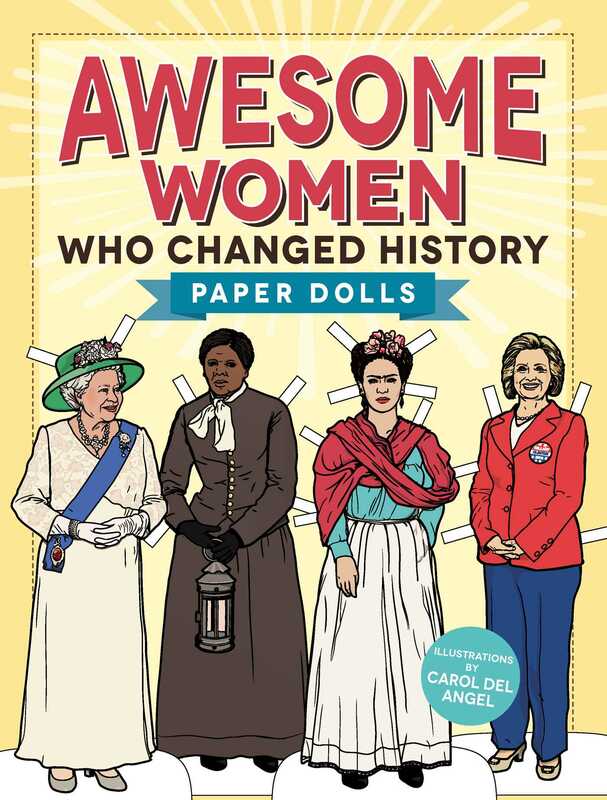 "Awesome Women Who Changed History: Paper Dolls allows your child to learn about incredible women who changed history while she plays with paper dolls (with which she can then decorate her room!)." "While kids can learn about history, they can also make up their own stories. Oprah can meet Harriet Tubman, or go on a flying adventure with Amelia Earhart. And really, what better way to teach kids about women’s history, than to put it in their own hands and let them bring it to life?" "Attention parents! If you're looking for a book that represents woman that have made a positive mark in history then Paper Dolls Awesome Woman Who Changed History is the book to get!" "A great way to encourage children to pursue STEM fun is with Awesome Women Who Changed History: Paper Dolls. This empowering paper doll collection includes famous women from history and modern times, such as Sally Ride, Harriet Tubman and Jane Goodall." "This collection of colorful paper dolls features a wide spectrum of trailblazers from women’s history. This fun activity book will definitely foster adult-child interaction as families study the included biographies about each of these women together. I can just imagine all the young girls playing dress up with these amazing women, while their mother’s teach them about the women who shaped the world we live in today."